The Church of Elijah the Prophet, which collapsed in the mid-20th century, has been brought back to life through the efforts of restorers. The wooden churches of the Russian North are among the most remarkable creations of traditional Russian artistic culture. Unfortunately, the passing years have taken their toll on these structures, and a number of the best examples have been lost over the past few decades. 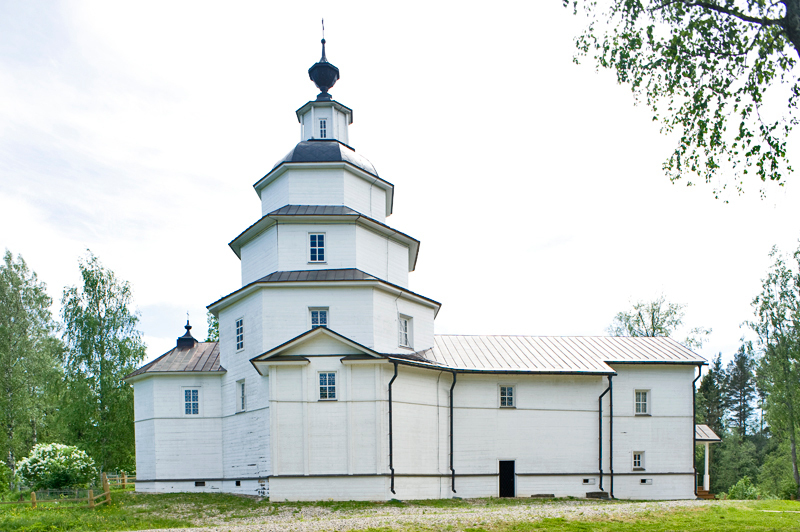 There is, however, a recent extraordinary example of the large-scale restoration of a northern log church — the Church of Elijah the Prophet at Tsypino in the Vologda Region. Appropriately, this monument is located near one of Russia’s most revered cultural and spiritual landmarks, the Ferapontov-Nativity Monastery, designated a UNESCO World Heritage site for its complement of early 16th-century frescoes by the Moscow master painter Dionisy. The village of Tsypino is now tiny (a population of one, according to the 2002 census), but its origins date at least to the 16th century,however, and in the late 19th century, it was the center of a thriving agricultural parish that included over 20 villages. At that time, the village was adjacent to a sacred territory known as Tsypinskii Pogost, which consisted of the Elijah Church as well as a brick church built in 1800 with altars dedicated to St. George and St. Demetrius of Thessaloniki. The entire territory of the pogost, which included parish houses and a cemetery, was surrounded by a solid wooden fence painted white. Take the train from Moscow to Vologda (Yaroslavsky railway station; travel time 8-9 hours), then take the local bus from Vologda to the the town of Kirillov and then take the local bus from Kirillov to Ferapontovo (departure 8:30 a.m., 2:00 p.m. every Tuesday and Thursday, travel time 30 min). Then walk about 1 mile to Tsypino. The priest of the Elijah Church for much of the late 19th century (1862-1895) was Father Ivan Brilliantov, two of whose sons, Alexander and Ivan, became specialists in Russian history. Ivan in particular played a leading role in the study and preservation of the extraordinary artistic legacy surrounding the Ferapontov Monastery, Tragically, both succumbed to the wave of Soviet repression directed against historians in the early 1930s. The Elijah Church, as it stood in the 19th century, was built of pine logs in 1755 and consecrated in 1756. Then, as now, its tall, spacious form consists of three ascending octagonal tiers over an octagonal base, from which extend four arms of the cross. The east arm contains the main altar and the west arm serves as the main entrance. The base structure of the church is encompassed on the south, west and north sides by a raised gallery resting on extended logs. The structural design is a marvel of functional ingenuity and aesthetic harmony, enhanced by an ideal site overlooking the small Elijah Lake. The interior of the church was centered on a large icon screen that rose into the canopy formed by the upper tiers. Four ​majestic rows of sacred images looked down upon those assembled in the church’s wide octagonal space, unencumbered by columns or piers. Closed in 1935, the church fell into decay. The cupola collapsed in 1958, and the two upper tiers fell soon thereafter. By that time, the icons had already been collected in the nearby local history museum in the former St. Cyril Belozersk Monastery in the small regional center of Kirillov. Fortunately, this remarkable example of Russian wooden architecture had been documented in photographs and was not totally forgotten. In 1995, a presidential order included the Elijah Church in the list of architectural monuments of national significance. When I first photographed the structure, in the summer of 1996, work had just begun on clearing the overgrown site around the surviving log courses of the base structure. The restoration proper was begun in 2003 under the direction of Alexander Popov, a leading practitioner of historic restoration methods with an emphasis on log structures. The first task in the restoration process was to completely disassemble and study the remaining structure. An examination of stroke marks on the original logs led to the creation of extended, narrow-bladed axes replicating those used in the construction of this 18th-century structure. The careful, methodical rebuilding of the church by master craftsmen extended through the summer of 2009, when the monument was reopened to visitors. As in the 19th century, the exterior is clad in plank siding painted white. This was typical practice in the 19th and early 20th centuries, but post-war Soviet restorers of wooden architecture made a practice of removing the siding for a more “authentic” appearance and to better appreciate the construction techniques. A new approach recommends recreating the siding in specific cases where it is clearly documented. Some have argued that this helps preserve the log structures. Work has continued on the interior of the Elijah Church. In 2010, a reconstruction of the carved wooden icon screen was completed with photographic reproductions of the icons.. The original icons remain in the excellent museum at the St. Cyril Belozersk Monastery, where they are preserved in a secure and regulated environment. The gallery of the Elijah Church contains museum displays on the region and its folk culture. The sublime Elijah Church has now been joined by a tiny log chapel brought from the nearby village of Pasynkovo. Its square logs, tightly joined by a dovetail technique, were reassembled in 2010 by a team of Polish restorers. Although not fully recreated in its pre-revolutionary form, the Tsypinskii pogost site has been resurrected as a worthy addition to the masterpieces at Ferapontov Monastery and the St. Cyril Belozersk Monastery. The town of Kirillov is now the headquarters of the “Russian North” National Park, closely linked to tourist destinations such as White Lake (Beloe Ozero), the neighboring historic town of Belozersk and the Tsypina Gora ski resort. Despite the continuing loss of monuments of Russian wooden architecture, the Church of Elijah the Prophet at Tsypino is stunning testimony to what can be accomplished with the proper combination of historical documentation, technical expertise and financial support.